Unit fully renovated in 2012. Look out bedroom windows each morning to the beach and ocean. Enjoy the two balconies, updated furnishings and state of the art kitchen and bathrooms. This villa is popular throughout the year. With two king-size beds and two twin beds, we can accommodate families as well as couples and golf groups. Updated baths include spa-like showers in 2 of the bedroom suites. Unit served by elevator, and right next to stairwell for easy access to the beach right in front of the building. We are located just a short walk from Night Heron Park, with its Nature Center, bicycle rentals, volleyball court, and soccer field, when the beach does not beckon. (Guests will not be able to utilize the pool at Night Heron Park.) Our kids loved the hermit crabs, checking out the tide pools (the relatively flat beach makes for a huge beach at low tide), and collecting shells, as well as watching the dolphins near low tide. Protected by a security gate, Kiawah Island is famous for its golf, its 10 mile long beach, well-maintained plantings, water and marsh views, and wildlife, including deer, many bird varieties, and the occasional bobcat. You are sure to love the setting as much as the activities available. Kiawah Island offers a, four great golf courses, including the PGA-hosting Ocean Course, miles of bike trails, a variety of restaurants on island and nearby, tennis courts, dolphin watching, and many more adult and family activities. Our building is immediately south of the Sanctuary hotel, providing nearby shops and dining experiences to enjoy. For your ease in helping to confirm your rental, payment, key pick up, and service while you are enjoying your vacation, we coordinate our VRBO bookings with our rental agent. (Taxes and service charges totaling 13% of the rates listed below are added when you book. The deposit on booking is $250.00, with the balance due 30 days before the vacation date.) The villa is cleaned before each visit, and you may request additional cleanings or other service during your stay. Wyndham Vacation Homes will make travel insurance available, but it is not required by them or by us. Unlimited local and long distance phone service throughout the United States is included. We have a wireless internet transmitter in our unit to provide you with a strong wi-fi connection for your laptop. DVD movies are available at no charge through our rental agent at Kiawah. We cannot permit any pets in our unit. Thank you for making other arrangements for them, before your visit. 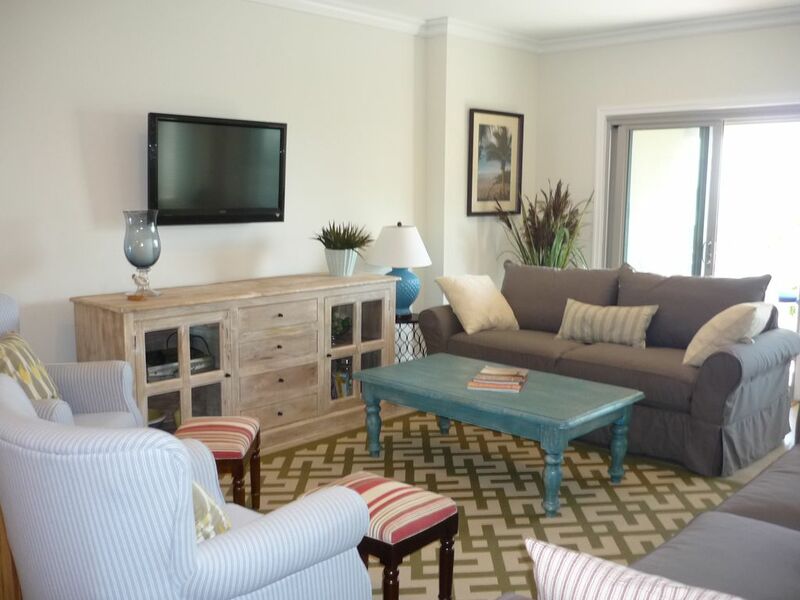 You will love Kiawah Island, and you are sure to enjoy the sights, sounds and convenience of our beachside villa. Shireen and Gary Moore are Illinois natives, currently living in the Chicago suburbs. Kiawah Island was beautiful, and the golf, ocean and Charleston offer many opportunities for our family. The unit overlooks the beach and we are just steps away from the Atlantic. We have worked to make the villa well-decorated yet relaxing. Our building is well-located on Kiawah Island, being adjacent to a major hotel and near the East Village tennis center and deli/grocery. Ideal for families, couples and groups looking to enjoy the beach and experience everything Kiawah and Charleston have to offer. Freshfields Village at the entrance to Kiawah Island offers unique shopping opportunities, a variety of restaurants and a grocery store, with prepared foods and a variety of gourmet items as well as staples. We are fortunate to have a number of families who stay with us from year to year. Showers in 2 bathrooms; tub with shower in bathroom adjoining bedroom with twin beds. A Top Ten beach, as rated by Dr. Beach. Quartz countertop; open to dining area. Videos available for the week. (2) Balconies at living room and master bedroom. Four resort courses on the island, including PGA hosting Ocean Course. Unlimited Long Distance within U, S, Two Balconies, Elevators and Stairs, Boardwalk to Beach, Free DVD Service. Completely renovated in 2012. Loved the place!! The oven light never went out. That was the only problem. Beautiful property with magnificent views on the beach. Just wonderful! Located on the beach and right in the middle of Kiawah Island. Golf, tennis, bicycling, dining (or eating in) are all right there. Great and unique shopping at Freshfields, just outside Kiawah, with the dining, shopping, history and sightseeing of Charleston just a short ways away. From local barbecue to Low Country specialties to fine dining, Charleston has been consistenly ranked as a top vacation destination, and the beach a "top 10" beach. All rates are before taxes and fees, which are approximately 17%. After rate is accepted and deposit is given, balance of reservation and payment are handled by our property and rental manager, Wyndham Vacation Homes, which provides key pick-up, housekeeping and repair services.